Owing to our expertise in this domain, we are engaged in offering a distinguished range of Rotary Roaster. This is available in a variety of models so as to meet various requirements of our clients. The offered range is widely used in various industrial applications. Our offered roaster can be availed from us within promised time-frame at market leading prices. Moreover, we deliver the entire range from our end after testing properly. Aiming to satisfy our clients, optimally, we provide our clients with a quality approved array of Rotary Roaster Machine. The offered machine is designed by our skilled professionals, using optimum quality basic material and latest technology in accordance with the specifications and requirements of our clients. Furthermore, the entire machine is well checked against various quality parameters to ensure their quality attributes. 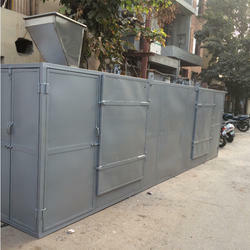 As well-known in the relevant industry, we are presenting a superior quality range of Snacks Continuous Dryer Machine. To enhance efficiency of offered dryer machine, our professionals use updated technology and quality assured components while manufacturing. Additionally, our offered range of machine goes through a series of testing procedures under the vigilance of our quality controllers, ensuring that only flawless products are delivered from our end. Clients can avail the offered range from us at market leading prices. Amidst our wide range of industrial machines, we are also engaged in offering a wide range of rugged designed Rotary Drum Roaster. 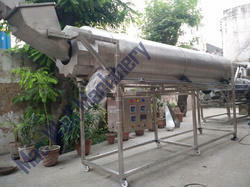 In order to ensure the quality of this drum roaster, our team of experts tests the entire array on various parameters. Apart from this, we provide our entire range in different specifications, in order to meet varied needs of clients. Furthermore, this range is highly acknowledged for their long-lasting performance among our clients. With the extensive knowledge and experience in this respective domain we are offering an extensive range of Dry Fruit Roaster that are designed to perfection and is manufactured using premium quality raw material and modish technology. Moreover, the fruit roaster offered by us is available in various specifications and can be also effectively customized as per client's specifications. In addition to this, offered range is highly demanded by the clients for its excellent features.